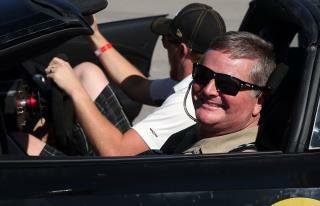 (Newser) – Ever since he was a little boy, Sam Schmidt wanted to race cars. He was living that dream, driving in the Indy Racing League when a crash on a test run in Orlando severed his spinal cord in 2000, leaving him paralyzed in all four limbs. On Wednesday, however, Schmidt was back in the driver's seat, blowing into a tube that allowed him to speed away in a modified sports car, the Las Vegas Review-Journal reports. Schmidt, 52, has become the first person in the US to be issued a license to drive a semi-autonomous vehicle. The restricted license allows him to hit the Nevada streets in his specialty 2016 Corvette Z06, though with a licensed driver in the passenger seat and only when following a pilot car. What good is a license that only allows you to drive when you've got a support team hovering over you? More money than brains got this man into the first serious accident that made him disabled. Now he will do it again and take more people with him.